Primary job of security and military forces is to protect and defend the people of their nation. In the situations we are observing every day and the world we are living, both military, also called armed forces and security forces as well became more and more important for the people. There is so many branches of military and security serving, we do not even know about them and do not even realize how many people is involved in serving our countries. Next month, our company with FeelOXY product – pure oxygen in a can is going to be a part of Eurosatory, the world’s largest defense and security international exhibition, taking part in Paris. Because we are going to present our FeelOXY product there, we decided to write an article about the importance of additional oxygen for defense and security purposes. Defense and security forces are every day facing with physical strains, weather in training or in missions. Nevertheless, physical training they are facing can be really challenging for their body, also mind. Because there are three types of muscles in the body, skeletal, cardiac and smooth, we have to provide enough oxygen for all of them. Most of the energy produced is used for the demands of muscle contraction. Even more, when in physical strains, for security and defense forces even more important, muscles perform harder work, which means even bigger use of oxygen. Heart rate increases and with that also use of oxygen. However, because of the harder work, loss of oxygen while performing higher physical activities cannot be replaced only by breathing since all of the energy is consumed immediately. This is why we recommend additional oxygen for all those who perform harder physical work. Additional oxygen thus presents key component of optimal physical and mental health. Especially we recommend it to security and defense forces, since it will help you to reduce exhaustion during forces trainings and missions, increase energy demand before physical strains and faster regeneration after extreme exertion, it will also help you in the execution of your duties in areas with polluted air and at the altitude where air is thinner, because it will provide your cells with enough oxygen to perform basic living actions, additionally it will help you to increase the concentration and reduce the level of stress and in the shortening of reaction time. 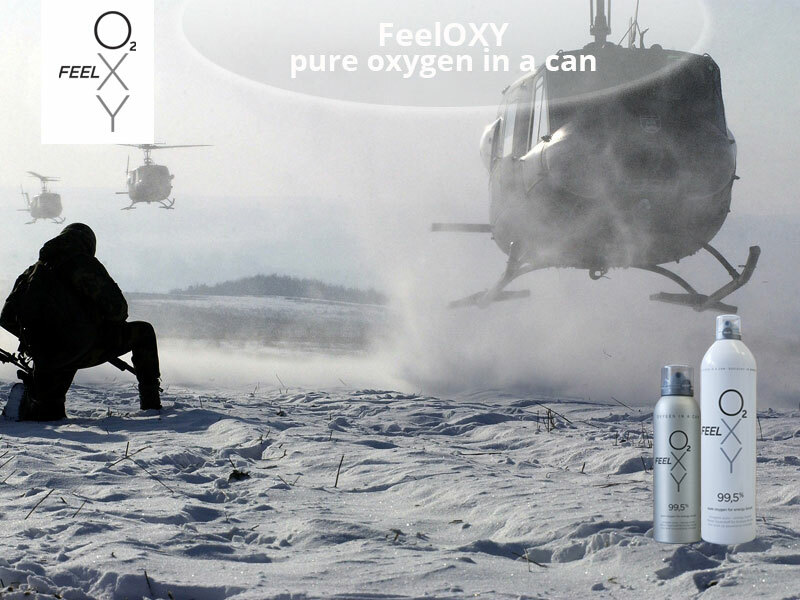 Since security and defense forces are somehow forced to live their lives in a healthy way, we must mention that FeelOXY – pure oxygen in a can is is all natural product, contains no calories, no artificial substances, all the materials are from European Union and it is not declared as doping by the World Anti-Doping Agency. Additional oxygen will give you more natural energy and help you overcome every day physical strains issues and challenges connected with duties or in your personal life. This entry was posted by Jaka in Uncategorized.